Hinrichs v. Bosma. The Becket Fund for Religious Liberty (n.d.). Retrieved from https://www.becketlaw.org/case/hinrichs-v-bosma/. Hinrichs v. Bosma. (Apr. 04, 2019). https://www.becketlaw.org/case/hinrichs-v-bosma/. "Hinrichs v. Bosma." The Becket Fund for Religious Liberty. Accessed [Apr. 04, 2019]. https://www.becketlaw.org/case/hinrichs-v-bosma/. For 188 years, the Indiana House of Representatives had a long-standing tradition of opening each day of legislative business with a prayer. These prayers were offered by local chaplains and clergymen from a variety of faiths. In 2005, several Indiana taxpayers filed suit against the legislature claiming that allowing “overtly sectarian prayers” was unconstitutional because it violated the Establishment Clause. The district court ruled in their favor. Becket filed a friend-of-the-court to the Seventh Circuit criticizing the lower court’s decision that the Establishment Clause prohibits “sectarian” prayer at the Indiana legislature, but allows “non-sectarian” prayer. Our brief demonstrated to the judges the historical pedigree of the term “sectarian” to help realign its definition with its original connotation. The Seventh Circuit then overturned the lower court’s decision. Winston & Strawn LLP represented the Indiana legislature. 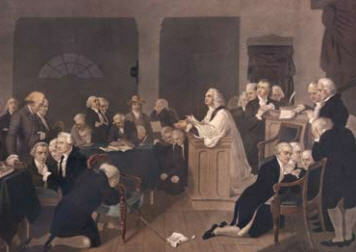 *Photo: First Prayer in Congress, September 1774, by: H.B. Hall. Used by permission.